Jervaulx Fly Fishers club offers a wide range of running & still water fly fishing on and around the river Ure in the heart of rural North Yorkshire. We also have salmon fishing on one of the most beautiful stretches of the river Ure. The club is well established and its origins go back to the mid-seventies when the late Major W.V Burdon took ownership of the Jervaulx Estate. The spring lakes in the estate park were developed for trout fishing and the newly formed Jervaulx Fly Fishers Club, founded by Bob Dales and John Walne, took the lease for fishing on the River Ure and the estate lakes in 1981. Over the three decades that have passed since then, Jervaulx Fly Fishers has gained an enviable reputation for high quality trout fishing and today it is one of the most desirable fly fishing clubs in the Yorkshire Dales National Park. A testament to this commitment to quality is that we still retain many of our founder members. The club prides itself on the friendly face it presents to new members and it has a continuing policy of acquiring new locations, having added more river and still waters to the original Jervaulx estate waters. This philosophy, together with the wonderful scenery that surrounds our fisheries, makes Jervaulx Fly Fishers very special and accounts for why so many of our fishers have been signing up every year for quarter of a century. We have equally long established relationships with the local hatcheries and we believe that we offer some of the finest conditioned trout in the north of England - which translates into free-rising and hard fighting fish that you will never forget. Jervaulx Fly Fishers is one of the few fishing syndicates to have had a book written about it - much of Bob Dales' entrancing book Fly Fishing in Herriot Country (published by the Medlar Press) being about waters which are fished by the syndicate, or are very close to ours. If you have family to consider, one of the biggest attractions of the club is its situation in the heart of Herriot Country. The Dales National Park is a truly wild place and offers fantastic opportunities to watch birds of prey, including red kites, and if you are very lucky you might even meet an otter. There is no shortage of attractions for families to visit, ranging from Jervaulx Abbey itself, to the aboretum at Thorp Perrow, and the wonderful scenery around Swinithwaite. All three locations have tea shops which make the ideal places to discuss a memorable day out - then of course, you could always treat yourself to a beer or two at the superb Blue Lion Inn at East Witton, which is little more than a stone's throw from our water. There really is more to fishing than catching fish. This year-round fishery will be stocked on 13th March with 100 rainbow trout. 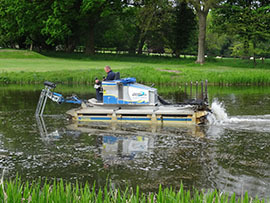 During the winter, the estate has done some dredging and clearing of rushes at the boat house end of the lake. The lake has cleared following the work, and water clarity is excellent. The removal of some trees, on JFF side near the boat house, has allowed some open casting access to this sheltered area. During the season this is a good place to take fish on the dry as they take midges and lake olives in the shelter of the trees. There are still some overwintered large brown trout and rainbows which will supplement the new stock. The middle stretch of the lake starts to weed up after May so early spring fishing is recommended. The new season for trout starts on Monday 25th March In early March we have had some good spates of more than 2 meters and bank erosion has been minimal compared to previous years. The new salmon fishing season this year started on February 1st. Our Jervaulx stretch allows salmon fishing to those members paying the supplementary club fee. Brown trout are due to be stocked in early May. Big hatches of grannom sedge flies from mid April encourage feeding activity around the noon period. The new season starts here on Monday April 1st New stock rainbows will be introduced to the lakes on 20th March. During the close season there have been sightings of overwintered fish in No 2 Lake. As I write in early March, No 1, and No 2 Lake are full of water and overflowing. No 3 Lake is comparatively low and it is hoped that the water level will better by the start of the season. 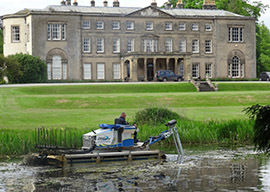 Trout fishing starts as Jervaulx on March 25th. No stocking takes place by JFF or Bolton Estates, so all trout present are likely to be wild. Previous years have shown plentiful hatches of true march browns around noon at the start of the season in the area of the Bishopdale Beck. Catches of wild brown trout to the dry march brown imitation can be very rewarding. Don't forget that the fishing is for trout and grayling only and is catch and release. Can we politely remind members that barbed hooks are not to be used? If you use flies tied on barbed hooks, please crush the barb with pliers before fishing them. A fish has recently been caught at the Jervaulx lakes with a barbed hook in its mouth. Can we also remind members that the rules specifically exclude the use of lures. I have put up a second collection of pics taken last season. Visit the photos page, or click here. The can be reached via the link on the menu bar above this post, or you can download a free app called TapaTalk onto your phone and login with that. The forums are a great place to ask what is working and what is not, and every document the club produces can be found in the announcements forum, so it is a good place to find stuff you need. The pictures here show the work being done at Thorpe Perrow.